The Black Strat is the subject of a definitive book by David Gilmour’s longtime guitar technician Phil Taylor, remaining the only guitar to have its detailed chronological history so meticulously and accurately documented. Taylor, P. Pink Floyd: The Black Strat - A History of David Gilmour's Black Fender Stratocaster, Great Britain, 2017, illus. cover, pp. 1, 4, 6, 14, 15, 16, 18, 23, 29, 32-40, 42-44, 46-51, 54-59, 63-66, 69, 72, 75, 76, 78, 81-94, 96-98, 100, 101, 104, 105, 108-1112, 115-117, 119, 121-124, 129-133, 139, 148-152, 154-155, 158-160, 162-164, 166-173, 175-186, 188, 191, 194, 197, 200, 202, 206, 208, 212-234, 236-245, 250. Fielder, H. Pink Floyd Behind the Wall, New York, 2013, illus. pp. 62, 63, 71, 78, 86, 91, 100, 105, 106, 122, 198, 204. Guesdon, J-M. and Margotin, P. Pink Floyd: All The Songs, New York, 2017, illus. pp. 242, 245, 265, 269, 275, 277, 307, 317, 336, 340, 357, 397, 403, 421, 431, 471, 565. Popoff, Martin. Pink Floyd: Album By Album, Minneapolis, 2018, illus. pp. 56, 67, 83, 99, 104, 118, 131, 151, 158, 223. Povey, G. The Complete Pink Floyd, New York, 2016-2017, illus. pp. 150-151,171,189, 206, 222, 243, 253, 332, 368, 393, 397. Povey, G. and Russell, I. Pink Floyd: In The Flesh, London, 1997, illus. pp. 100, 126, 135, 160, 179, 189, 222, 243, 253, 332, 368, 393, 397. Povey, G. Pink Floyd in Objects, London, 2018, illus. pp. 78-79, 81. Scarfe, G. The Making Of Pink Floyd The Wall, London, 2010, pp. 119, 230. Wheeler, T. The Stratocaster Chronicles, Milwaukee, 2004, illus. p. 148. Pink Floyd: Their Mortal Remains, London, 2017, illus. pp. 106, 125, 236, 237. Interactive Guitar Magazine, 2017, Issue #47, illus. cover. Guitar & Bass Magazine, March 2008, Vol 19, No3, illus. cover. Guitar World, March 2006, illus. cover. Guitarist, February 2015, Issue 390, illus. cover, pp. 66-67. Q Pink Floyd Special Edition, September 2004, illus. pp. 38, 58, 68, 79. Through the annals of rock history, David Gilmour’s black Fender Stratocaster stands out as one of only a handful of guitars that have taken on a life of their own and gained a level of fame to near match their owner. Despite humble beginnings as an off-the-shelf standard model Stratocaster, the extensively modified guitar has become a legend in its own right. Of all the instruments in Gilmour’s considerable collection, it is the black Stratocaster that has served him the longest as both a performance and recording tool, appearing on every Pink Floyd album from 1970 to 1983 and all four of Gilmour’s solo albums to date, becoming synonymous with his image and tone. A mainstay at the zenith of Pink Floyd, the guitar was integral to the recording of the band’s seminal masterpiece The Dark Side Of The Moon (1973), as well as follow-up albums Wish You Were Here (1975), Animals (1977) and The Wall (1979), forming the four cornerstones of the classic-era Floyd. Heard by billions of people across the globe over the last forty-nine years, the music Gilmour created on this trusty Strat will undoubtedly live on for hundreds more. Purchased new at the already iconic New York guitar store Manny’s on West 48th Street in May 1970, David Gilmour acquired this guitar to replace a black Stratocaster with a rosewood neck that he had purchased just six weeks earlier at the outset of Pink Floyd’s third US tour. Gilmour garnered a mere fifteen performances with that first Stratocaster before it was stolen, along with the rest of the band’s equipment, following their second show in New Orleans. Although the majority of the equipment was recovered, Gilmour's first black Stratocaster was never seen again. With the band forced to end the tour early, Gilmour flew home to London via New York, making an emergency visit to Manhattan’s “Music Row” to purchase another black Stratocaster, this time with a maple neck, from Manny Goldrich’s famous music store. Recalling his memories of Manny’s in the early 1970’s, Gilmour told us It was already legendary… It was a very New York experience. The sort of thing us English boys had seen in films and stuff… it’s hard to describe but it was a wonderful place. This second black Stratocaster, which would become known as “The Black Strat,” bore a serial number dating the guitar to 1969, a custom black finish sprayed over sunburst and a maple neck. The Black Strat made its first appearance on stage at the legendary Bath Festival of Blues and Progressive Music, Shepton Mallet, Somerset during the early hours of Sunday 28th June 1970, where Pink Floyd appeared on the bill alongside Led Zeppelin and Jefferson Airplane. Accompanied by a brass ensemble and 12-strong choir, the band debuted a new 25-minute piece, then titled The Amazing Pudding. Pink Floyd had begun recording the piece, later renamed Atom Heart Mother and forming an entire side of their 1970 album of the same name, prior to their US tour. Resuming recording on their return from the States, The Black Strat made its first appearance on a Pink Floyd record. No known photographs exist of the performance and only very murky footage has surfaced, however The Black Strat can be clearly seen in documentary film footage of the Kralingen Music Festival in Rotterdam, where Pink Floyd performed later that day. 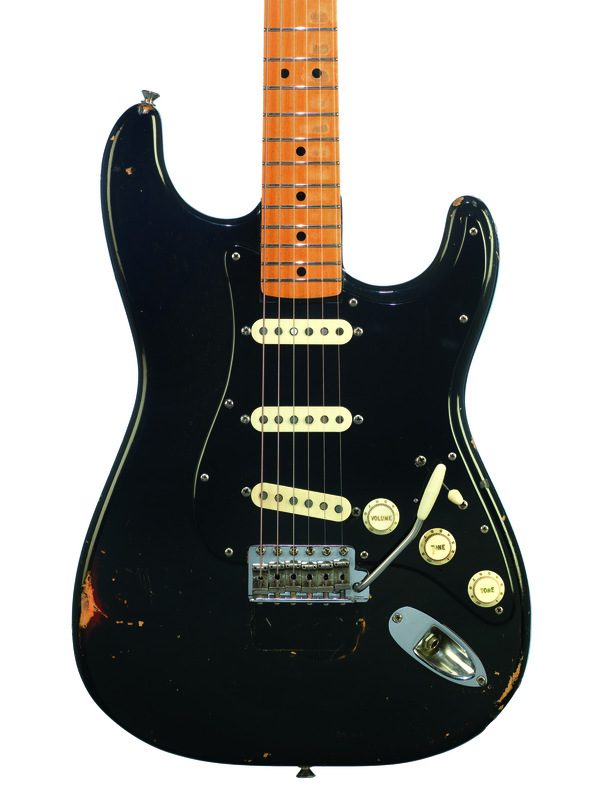 After a period experimenting with other guitars including a sunburst Stratocaster, a brown Telecaster and a white Stratocaster (lot 1), similarly purchased to replace a white Strat stolen in New Orleans, Gilmour had settled on The Black Strat as his main instrument by 1971, as the Atom Heart Mother World Tour rattled through Europe, Japan and Australia. It became my main guitar, Gilmour told Matt Everitt in 2018, the one I used pretty much on everything unless there was a reason to want a different sound. Gilmour used the guitar throughout the band’s magical performance to an empty amphitheatre at Pompeii in October 1971 for the concert documentary film Pink Floyd: Live At Pompeii, playing it both conventionally and with a steel slide bar, balanced on his lap on the ground. Additional footage shot at the Studio Europasonor in Paris showed bassist and songwriter Roger Waters wielding The Black Strat for a rendition of Mademoiselle Nobs while Gilmour played the harmonica. Gilmour’s prime electric during recording of Pink Floyd’s transitional 1971 album Meddle, The Black Strat was used for all guitar parts on the 23-minute sequence Echoes, which remains an enduring highlight in the Floyd canon, noted for the sonorous ‘seagull calls’ Gilmour drew from the Stratocaster. The guitar thereafter travelled on the subsequent tour of the US and Canada in late 1971. It could be considered de rigueur that Rock guitarists of David Gilmour’s generation and talent are constantly altering the setup and fittings of their guitars to suit their needs as artists. Throughout the forty-nine years Gilmour has owned this Stratocaster it has been considered his working guitar, used to test new ideas and experiment with various modifications. In an interview with Guitarist magazine in May 2006, Gilmour admitted I've always considered that to be my bodge-up guitar that nothing is sacred on. I've had holes drilled in it. It's still a good guitar. Over the years, the guitar has been fitted with various pickups switches, inputs, pickguards, tailpieces and tuners and undergone no less than six different neck changes. All these alterations were performed in an endeavor to achieve the dynamics in tonal quality and playability required by David Gilmour at the time. One of Gilmour’s first alterations was the ill-fated addition of an edge-mounted XLR socket in 1972. Gilmour told us: At one point I drilled a big hole to put one of those big XLR things on it because I wanted to have the sound coming out of the guitar, going out through a pedal board, coming back into the guitar and going through a volume knob again… That didn’t last terribly long so I made some paste out of sawdust and wood glue and filled it back in again. His repair work is still very much visible on the guitar today. It’s probable that Gilmour’s XLR experimentations featured on Pink Floyd’s 1972 album Obscured by Clouds, recorded in an intensive two-week period at Chateau d’Hérouville near Paris in Spring 1972 as an atmospheric soundtrack to Barbet Schroeder’s 1972 film La Vallée. Since hailed as some of the band’s best work, the soundtrack album was somewhat eclipsed by the soon to be released The Dark Side Of The Moon, a concept album that would explore the stresses and pressures of modern life. After an early version was first performed on 20th January 1972 at The Dome in Brighton, the piece would be further refined and developed over the course of the year both live and in the studio. During this period, Gilmour switched to a rosewood neck from his sunburst Stratocaster. The first appearance of The Black Strat with rosewood neck, again at The Dome in June 1972, was also the first complete live performance of The Dark Side Of The Moon. Gilmour carried The Black Strat as his primary guitar on a tour of the US from September 1972, now modified with an additional pickup switch to allow him to select both the bridge and neck pickup at the same time, in an effort to achieve a sound akin to the Fender Jazzmaster. Gilmour told us: There’s a sound on a Jazzmaster which you get by having your bridge pickup and your neck pickup on at the same time. Now, on a Strat because you’ve got a middle pick up, the switch doesn’t do that... so I got a little piece of metal in a U-shape and glued it on to the underside and drilled a little hole and put a little switch in, and that switch switches on this pickup… which creates a sound a bit like the Jazzmaster… That was one of the experiments that I did that I still have. A series of benefit concerts and a European Tour followed in late 1972 with The Black Strat consistently serving as principal guitar. Gilmour thereafter routed out the pickup cavities to accommodate a Humbucker pickup, which he trialed during performances with Roland Petit’s Ballets de Marseille in January 1973. Sporadically recorded at London’s Abbey Road Studios from June 1972 to March 1973, The Dark Side Of The Moon was finally released in March 1973 to critical acclaim and instant chart success, remaining in the Billboard album chart for a record smashing 741 consecutive weeks and selling over 55 million copied worldwide to date. According to guitar technician Phil Taylor, Gilmour primarily used the Black Strat for his visceral guitar solos, rhythm parts and fills on the album, notably including his astounding solo on Time and two of the three solos on Money. The guitar again served as Gilmour’s principal instrument on the subsequent US tour, returning to a standard set of single coil pickups that June. Due to the overwhelming success of Dark Side, the Floyd began to play stadiums and large arenas. After a brief French tour in June 1974, the guitar truly earned its moniker when Gilmour replaced the standard white pickguard with a custom-made black pickguard which remains to this day, transforming the appearance of the guitar and creating an instantly recognizable all-Black Strat. The Black Strat played a key role during the recording of Pink Floyd’s 1975 album Wish You Were Here, a worthy successor to The Dark Side of the Moon and Gilmour’s favorite Floyd album. During rehearsals at London’s Unit Studios, the sublime four-note arpeggio that would inspire the Syd Barrett tribute and fan favorite Shine On You Crazy Diamond popped out of the guitar. Gilmour recorded all electric guitar parts for the album on his trusty Black Strat between January to July 1975 at Abbey Road, laying down the four-note phrase in the cavernous Studio One to capture the effect of a concert hall. After two short tours of the USA, the band headlined a concert at Knebworth on 5th July 1975 in support of their new material, marking the last time The Dark Side Of The Moon would be played in its entirety by the classic-era Pink Floyd line up. Now modified with a DiMarzio pickup in the bridge position, Gilmour used The Black Strat to record Pink Floyd’s edgier follow-up album Animals at the band’s new recording studio at Britannia Row in North London and throughout the subsequent In The Flesh Tour through Europe and North America. 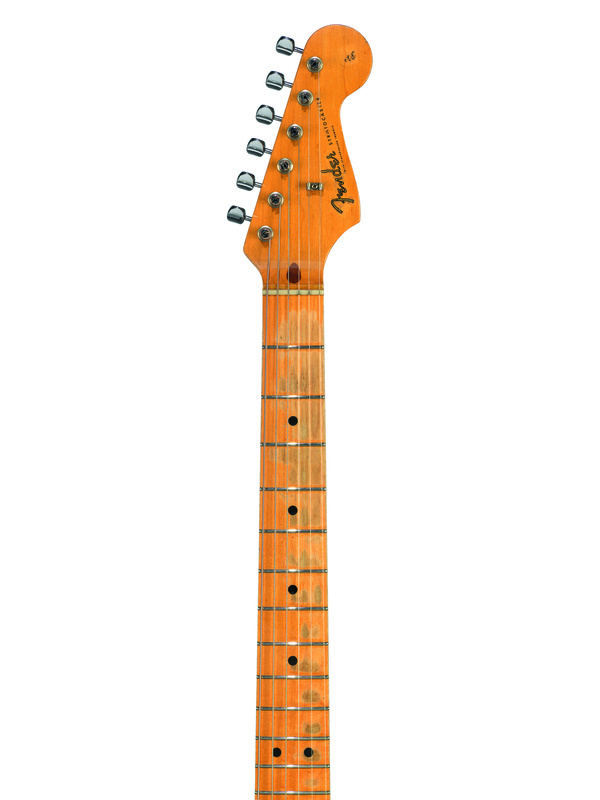 The rosewood neck was swapped out for a custom Charvel birdseye maple neck ahead of recording sessions for Pink Floyd’s next concept album The Wall, which began in April 1979 at Super Bear Studios in France, moving to Producers Workshop in Los Angeles through to early November 1979. Frequently voted one of the best solos of all time, Gilmour laid down his landmark solo in Comfortably Numb on The Black Strat at Super Bear, telling Guitar World in 1993: I just went out into the studio and banged out five or six solos. By the time the band kicked off their series of spectacular live shows in support of the album, which featured a giant wall spanning the width of the auditorium, the guitar sported a custom wound Seymour Duncan pickup in place of the DiMarzio, which remains on The Black Strat to this day. As the concept of The Wall had largely sprung from Waters’ hatred of the stadium experience, the exclusive arena tour consisted of only 31 dates in four cities - Los Angeles, New York, London and Dortmund in Germany - from February 1980 to June 1981. For performances of Comfortably Numb, Gilmour was dramatically picked out by spotlight, seemingly perched atop the wall as he worked The Black Strat. The London performances were recorded and released in 2000 on the live album Is There Anybody Out There? The Wall Live 1980–81. Returning to the studio in 1982, Gilmour played The Black Strat with a custom Charvel 22 fret birdseye maple neck on Pink Floyd’s 1983 album The Final Cut, enabling him to reach a semitone higher at the top end. Having predominantly recorded his eponymous 1978 solo debut album on The Black Strat, Gilmour re-enlisted the guitar to record his second solo album About Face at Paris’ Pathé-Marconi Studios in August 1983, recently modified with a Kahler tremolo system and a shortened tremolo arm to allow more control when playing. Gilmour told us I just one day took a hacksaw to it and cut it off and stuck the plastic bit back on the end of it… It suits me - I’ve found it much more useful and it’s helped to create a style, I guess. In a March 2008 interview with Guitar & Bass Magazine, Taylor admitted that the addition of the Kahler tremolo was less successful as it altered the sound of the guitar, explaining that it was one reason why it fell out of favor. Around this time, Fender brought out their 1957 vintage reissue series and The Black Strat was laid aside in favor of a Candy Apple Red 57V Stratocaster that would become Gilmour’s principal guitar for the next twenty years (lot 56). 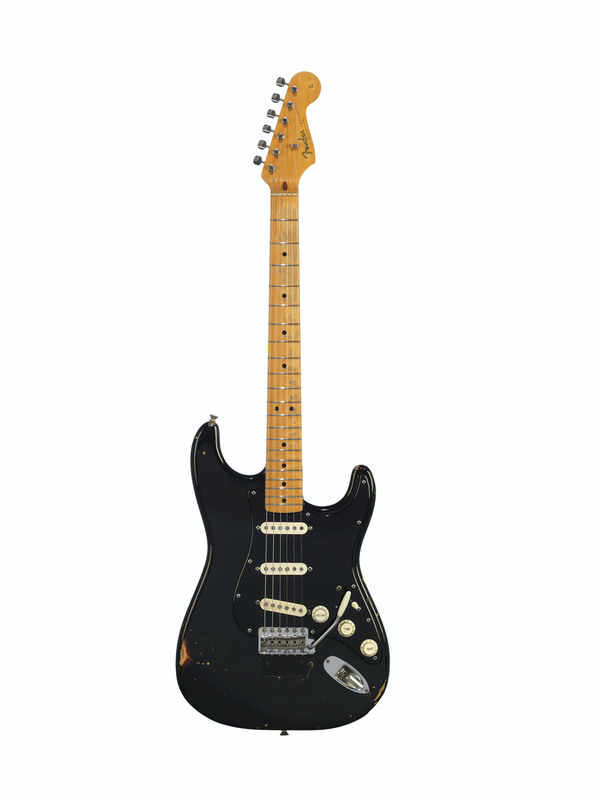 In August 1986, the now unemployed Black Strat was placed on loan with the Hard Rock Café in return for a charitable donation and was displayed in their Dallas restaurant for over a decade. In 1997 the guitar was returned in poor condition, lacking its original case, and sent to Chandler Guitars for restoration. The Kahler tremolo was replaced with the original Fender system, the resulting hole repaired, and the custom Charvel neck replaced with a new 57 vintage reissue neck to more closely resemble the 57V Stratocasters Gilmour had grown accustomed to. The guitar saw little use until 2003, when Gilmour played a few parts from The Dark Side Of The Moon for the Eagle Rock documentary The Making Of The Dark Side Of The Moon. The Black Strat made its big stage comeback, however, when Gilmour appeared with the guitar for a historic reunion performance with Nick Mason, Richard Wright and Roger Waters in their classic-era Pink Floyd line up at Live 8 in London’s Hyde Park on 2nd July 2005, their first performance together in 24 years. According to Taylor, when Gilmour first began playing The Black Strat during rehearsals, his guitar sound instantly ascended to what can only be described as ‘another level.’ His body language changed, becoming animated and interacting with the guitar as if he had just discovered an old long-lost friend. Bob Geldof is credited with persuading the band to reunite as headliners of the benefit concert, spearheading a string of 10 concerts held around the world in the run up to the G8 summit in Scotland with the aim of putting pressure on G8 leaders to end global poverty, and marking the 20th anniversary of Live Aid. Numerous photographs exist of Gilmour playing his old Black Strat alongside his former bandmates on this momentous occasion and footage of the band’s performance was included on the official Live 8 DVD, released on 7th November 2005. The return to prominence of The Black Strat led to its use on Gilmour’s subsequent solo albums On An Island (2006) and Rattle That Lock (2015), as well as the final Pink Floyd album The Endless River (2014). 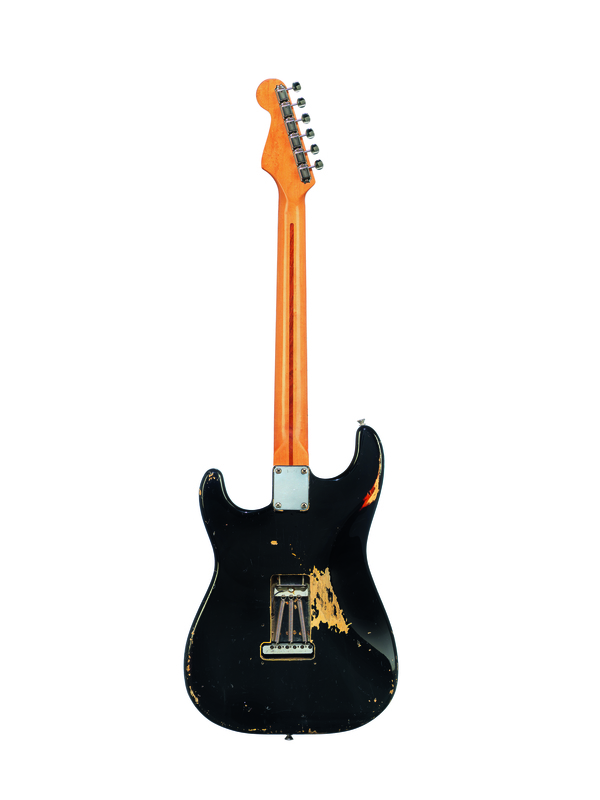 Prior to recording On An Island, The Black Strat received its current 1983 neck from Gilmour’s 57V Cream Strat (lot 53). Firmly re-established as Gilmour’s primary performance guitar, The Black Strat travelled on the On An Island Tour in 2006, featuring on the live concert DVDs Remember That Night and Live in Gdansk, released in September 2007 and September 2008 respectively, and the Rattle That Lock Tour from 2015-2016, the highlight of which was Gilmour’s return to Pompeii 45 years after Pink Floyd first played to the deserted amphitheatre in 1972. The two shows on 7th and 8th July 2016 were the first public performances at the Amphitheatre of Pompeii since the eruption of Vesuvius in AD79 and were recorded for the live album and film Live At Pompeii, released on 29th September 2017. The guitar has appeared with its owner at countless one-off and benefit performances over the years and shared the stage with such legendary artists as Jeff Beck, David Bowie, David Crosby and Graham Nash. Notably, Gilmour recruited former band member Roger Waters for a benefit performance at Kiddington Hall in Oxfordshire on 10th July 2010 in aid of The Hoping Foundation and repaid the favor with a guest performance of Comfortably Numb during Waters’ live shows of The Wall at London’s O2 Arena on 12th May 2011. In 2006, David Gilmour was approached by the Fender Musical Instrument Corporation asking permission to produce an accurate replica of The Black Strat. Despite his protestation that it was just an ordinary Strat that I bought at Manny's, Gilmour finally gave the go ahead for a series of prototypes and pickup configurations to be developed, tested and refined over the next two years. Once the fifth and final prototypes were approved by Gilmour for sound, feel, playability and visual accuracy, the guitar went into production and was released in September 2008. Todd Krause said of the process It was utterly just amazing, this overwhelming sense of history and the past and just being surrounded by it. 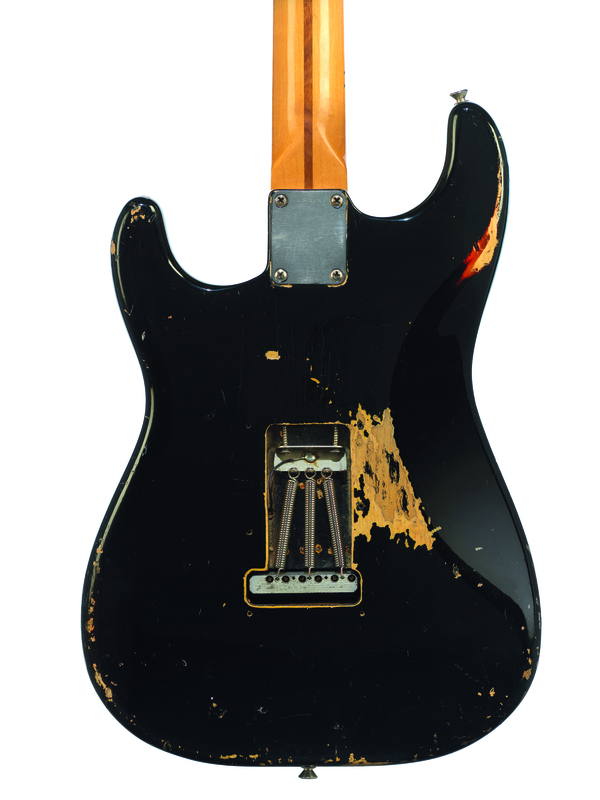 The Fender Custom Shop produced two models of the David Gilmour Signature Stratocaster - the Relic, which faithfully replicated the condition of The Black Strat as it appeared in 2008 with visual wear and distressing to the finish, aged parts and no backplate, and the NOS, or "New Old Stock," which similarly replicates the guitar as it is now, but with new parts, an 'as new' paint finish and a white plastic backplate. Gilmour said of the release They've done a fantastically good job to make it as good as I wanted it to be. We've worked quite hard on it, it's taken a while for us to get every part of it dead right. Despite its long and remarkable history, The Black Strat has never been treated with reverence by its owner but viewed as a working tool. It’s pretty battered and beat up, Gilmour told us …It’s been my experimental work bed for all sorts of stuff throughout the years. To the fans, however, the Black Strat has become an icon. The guitar has graced the covers of magazines, spawned a signature model and inspired a comprehensive and definitive biography. It has seen the meteoric rise of one of rock’s greatest bands and contributed to some of the best-selling albums in history. In the hands of David Gilmour, this faithful fifty-year-old black Stratocaster has channeled some of the most memorable melodies and scintillating solos of all time with a unique sound and tone that has never been replicated, rightly earning its place in rock and roll history.